Life can be so busy that the one thing we tend to forget and ignore is our own health. So, take a deep breath and give your body its very own MOT. Just like your car needs a regular service, the Body MOT is a great way of combining all of our treatments into one customised programme to restore your body to optimal alignment. The Body MOT will consist of a thorough consultation, drawing upon the expertise of the therapist in accurately evaluating the needs of the individual, centred on postural assessment, flexibility and the way your muscles work together. By palpating (feeling) your muscle structure/tone and using our extensive range of stretching/flexibility tests, our therapists will identify any soft tissue abnormalities (strains, reduced range of motion and other signs of injury) that may currently, or may in the future, cause you discomfort. This assessment will be used to develop a treatment plan to rectify any muscle imbalances and bring your body back into perfect alignment, allowing it to function and perform at its' optimum level. Allow your body to function and perform at its optimum level. 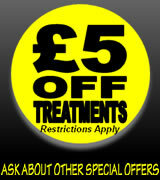 Sign up for our newsletter (special offers, top tips etc) and be entered in a draw for a free treatment at STRETCH!